A classy creation for a romantic occasion. Grease and line your baking tin with baking or grease proof paper. Place the mixture equally into the two tins and smooth the top with a spatula. Place the tin into the centre of the oven. Bake for 40 - 50 minutes, insert a cocktail stick or metal skewer to check if the cake is cooked evenly. Let the tins cool on a wire rack and wait 5 minutes before removing the cake from the tins and let them completely cool on the wire rack. Cool your cake layers upside down to help flatten them out, which will make your final cake much prettier and easier to assemble. When completely cooled, if the cakes are too ‘domed’ trim a little off to tidy them up. Place one cake on a plate or cake stand and put a big dollop of buttercream on the top of the bottom cake. Using a palette knife, start in the middle of the cake and spread the buttercream evenly over the top and just past the edge. The slight overhang of buttercream will help you frost the sides of the cake, then spread the jam on top keeping it slightly in from the edge so it doesn’t seep into the outer covering of buttercream. Place the second cake layer upside down for a lovely flat top, and press gently to make sure it sticks. Take a step back and check that it is level and centered. Now to prepare the cake with a ‘crumb coat’ of buttercream. The crumb coat is also an effective way to hide any uneven spots and imperfections in the cake, as these imperfections would show through the rolled fondant. The crumb coat can be used to fill in any holes or cracks in the cake and provide a smooth surface for the rolled fondant. One crumb coat layer is fine; however two thin crumb coat layers are best. The first crumb coat secures any “cake crumbs” and gives you a firm surface to work with. The second crumb coat is applied after the first layer has crusted in the fridge for half an hour or so and will provide the sticky surface required for the fondant to stick to. Put some buttercream on the centre of the top cake and using the palette knife, spread the buttercream to the edge. If you get crumbs in the frosting don't worry as this layer of buttercream is for this reason. Now the sides, smooth any oozing buttercream from the centre working along the edges giving a nice flat side. Take some buttercream onto your palette knife and working on one quarter at a time smooth back and forth to get a nice thin even covering as you did on the top of the cake, making sure you cover all the way down to the plate. Once the cake is covered in buttercream, you can go back and smooth it out, neatening up the corner where the top meets the side. Remove any excess buttercream. Knead it until it is a workable consistency. If fondant is sticky, knead in a little icing sugar. Lightly dust your smooth work surface and your rolling pin with icing sugar to prevent it sticking. Roll out fondant to the size of your cake, approximately 12 – 13 inches. To keep fondant from sticking, lift and move as you roll. Add more icing sugar if needed. Gently lift fondant over rolling pin and position over the cake. Smooth the fondant with a ‘smoother’ if you have one, or the flat of your hand. Beginning in the middle of the cake top, move the smoother round and round as if ironing moving outward towards the sides. Now smooth down the sides slowly and methodically to shape the fondant to the cake, this will push any air bubbles down to the bottom as you go. Use the straight edge of the smoother all the way to the bottom of the cake. Trim off excess fondant using a spatula or sharp knife. Tidy up the cut edge by running the smoother around it. If an air bubble appears, insert a clean pin on an angle, release air and smooth the area again. Take 100 grams of coloured ready to roll fondant, we used a fuchsia pink, and some pink sugar glimmer in a shallow bowl or side plate. Before rolling out fondant, knead it until it is a workable consistency. If fondant is sticky, knead in a little icing sugar. Lightly dust your smooth work surface and your rolling pin with icing sugar to prevent it sticking. Roll out fondant to ¼” thickness trying to get it as even as possible. 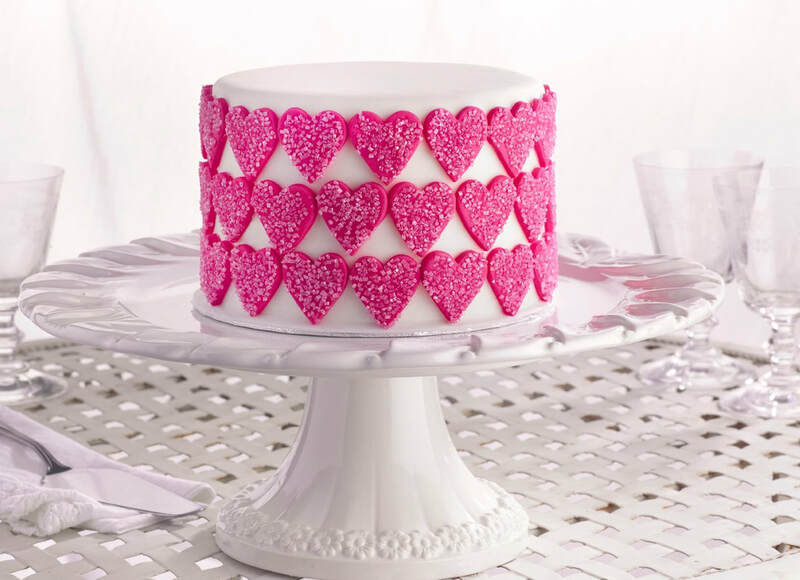 Use a heart shaped cutter that will fit comfortably onto the side of the cake in 3 lines, cut out the bottom row of hearts, using a lightly moistened kitchen towel, dampen the top of each heart and carefully push into the glimmer sugar so it is completely covered. Using a new lightly moistened kitchen towel, dampen the base of the fondant covered cake approximately the height of the heart shape, this is easier and quicker than dampening each individual heart. But please use a clean piece of kitchen roll each time. Methodically go round the base of the cake and attach each heart gently but firmly creating the bottom row. Spread the last few out to create less of a gap, or if the gap is quite significant make sure that this is the back of the cake that’s not seen! Create the next two layers the same way, creating the top line that lines up with the bottom row, then finish with the middle row.